A fully functional remote with colored keys make the installation quite foolproof. The increased resolution does put a premium on the internet connectivity. I had to bump up the internet service provider speed to over 3 Mbps in order to get a seamless viewing experience. If you are going to connect it using a wifi, then depending on where your wifi is set up, there maybe a need to get a solid reception to make the higher bandwidth reliably accessible. The newer model ship with a dongle to hook up the wifi usb receiver. Once the bandwidth issues have been properly resolved, the setup is quite straight forward and I did not run into any issues. The user options are now more logically presented and the content is better organized. One major improvement is the ability to cancel a command that is taking time to implement. I found accessing content in myGroups more enjoyable than the channels on Jadoo Live. The content is heavily biased toward the Indo Pakistan sub continent. The sheer diversity of programs in a multitude of languages can be easily experienced with a flick of a switch. I enjoyed watching the coverage of the same events from Indian and Pakistani perspectives. 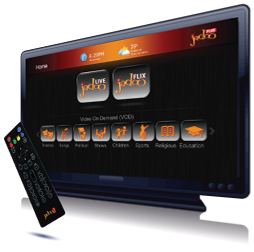 Prior to devices like JadooTv, one had to visit a country to experience cultural immersion. I even enjoyed watching ads about commodity products in different countries. The ads have a way of conveying cultural sensitivities and preferences in a very audio visual dense format. The user interface has laid the foundation of JadooTv being a lot more than being just an entertainment/news font. As I had written in one of my previous post that with the right content it can be a very powerful educational tool. The user interface has now been reorganized in a manner to lend development in that direction possible. In a highly connected world where South Asia and vicinity are going to play an ever increasing role in the world affair, you cannot go wrong making a one time payment on JadooTv 3 to remain informed.